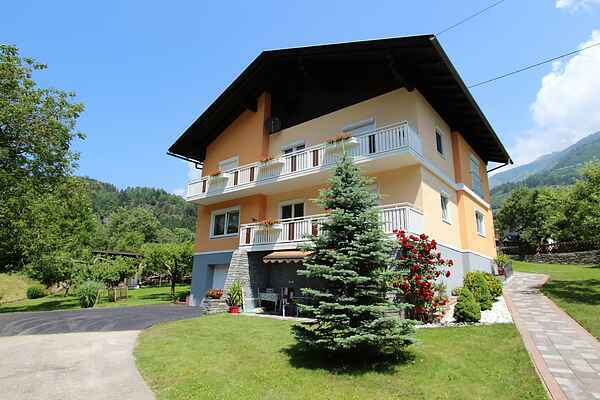 This spacious apartment is situated on the ground floor of a house in a quiet location in the beautiful Mölltal valley. The building that houses this holiday home is situated in a quiet neighbourhood and features a large garden with terrace, which guests are free to use. You'll be sharing the house with the owner, but with your own, separate entrance, so your privacy is guaranteed. There are two bedrooms in the apartment, each with a double bed, and both recently refurbished. The spacious, separate kitchen has all modern comforts and the living room has a pleasant and comfortable interior. If you come with 5 people, we'll either put an extra bed in the bedroom, or you can make use of the sofa bed in the living room. There's even a washing machine in the bathroom. The Mölltal valley offers plenty of opportunities for active holidaymakers. If you prefer being on the water, Lake Millstatt is a good place to go to. Skiing enthusiasts can choose from the Goldeck skiing area in Spittal, the Ankogel ski resort in Mallnitz and the Mölltaler glacier, where you can find snow even during the summer months. Enjoy a wonderful holiday in Austria's sunny south and find total relaxation in these stunning surroundings. Daily there is a ski bus to the ski area Ankogel in Mallnitz and the Mölltal Glacier. The entrance is about 3 minutes from the apartment. In summer there is the possibility to play tennis after prior registration. (Costs about € 10.-p.hour) Rafting Rides on the Möll River and a canoe school are available on site. A climbing garden with different levels of difficulty and a climbing wall is available on the south side of Danielsberg.